That was the optimistic message of energy expert Tomas Kåberger, delivering the fourth keynote speech of the 11th Annual Meeting of the Environment for Development Initiative, in Addis Ababa, Ethiopia, October 26-30, 2017. 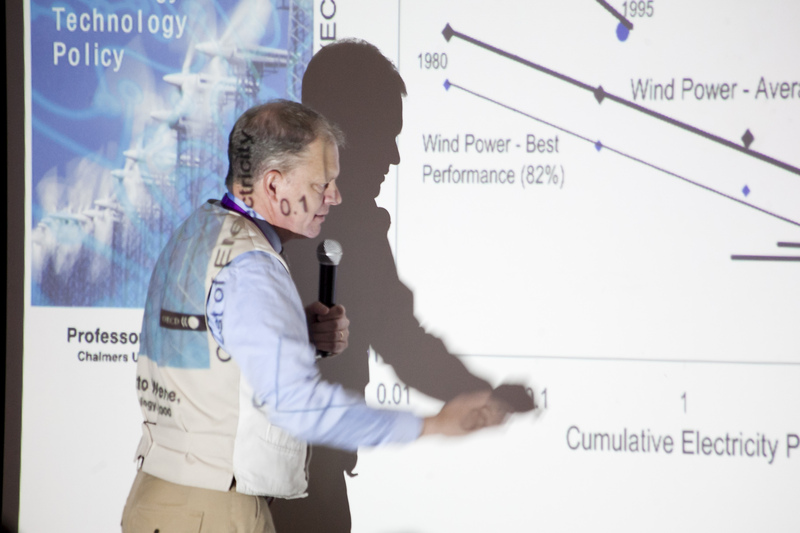 “In the last few years, we have seen dramatic reductions in cost, making solar and wind the cheapest sources in many parts of the world,” said Dr. Kåberger, who has worked in the business of producing electricity, directed the Swedish Energy Agency, and is now a professor, conservationist and international energy expert. The evidence is in the form of bids from solar and wind companies to electric utilities. The bids are measured in cost per kilowatt hour, and the bids for solar and wind keep falling relative to costs of electricity from nuclear energy or fossil fuel. Just this month, he explained, there was a record low bid to produce electricity using solar power – in Saudi Arabia. Naturally, solar costs are lower in the sunniest parts of the globe – which makes the Middle East, Africa and Latin America promising sites for solar generation. Less sunny areas such as Denmark still build a lot of solar but focus more on renewable power in the form of offshore wind generation. China, with its wide range of climate conditions, has taken the lead in wind power, from almost none in 2005 to the world leader in 2010. 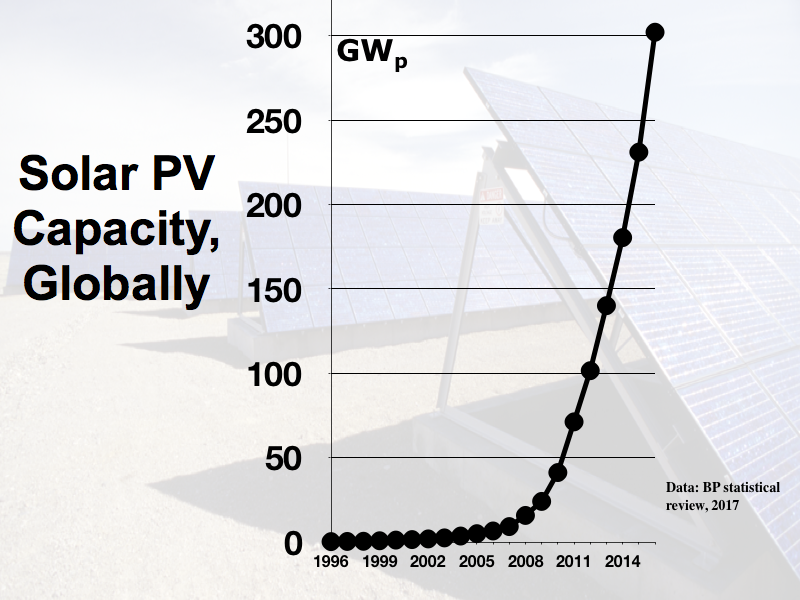 Globally, wind power passed nuclear capacity in 2015, noted Kåberger, and solar will do the same during the coming months, he added. Not only is renewable energy replacing fossil fuels for electricity generation. Solar and wind electricity is now produced at lower cost per unit energy then the cost of energy in crude oil. Together with low cost batteries this has made it possible to start replacing oil by renewable electricity in the transport sector. The cheapest solar power is now en par with liquified natural gas per unit energy, and instead of producing electricity from fossil methane gas, gas may in some years be produced from renewable electricity. This is how we can manage climate change risks without giving up economic development in the world, he says. What happens when the sun isn’t shining and the wind isn’t blowing? In the short term solar power is reducing the balancing problems in the electricity system as it is produced during day time. Storing solar power has become cheaper as the automotive industri has brought down the cost of batteries. Process industries may increase competitiveness by only consume electricity when it is readily available at low cost. And heating and cooling systems may also use electricity when cheap and store heat and ice avoiding using electricity when less is available. In some places, “there is more wind during the winter months and more sun during the summer months,” said Kåberger. An ensemble of solar, wind, hydro and modern biomass fuelled power plants can provide for low cost power systems. There is also the possibility of evening out supply and demand by investing more in power transmission over increasingly long distances – another technology that has developed and become significantly cheaper with Chinas large investments. At this point, market forces point strongly toward these renewable sources. In fact, power companies that haven’t kept up have lost money or even gone bankrupt. Tough times for old energy companies but a great time for the world. However, all of this is the result of a deliberate endeavour to subsidize these renewable technologies during the early phase, and facilitate the industrial learning that brought costs down. Much of this was done in Germany. “I don’t think it’s much of an exaggeration to say that German households have saved the world” by paying high electricity rates to boost technologies in their infancy, said Kåberger. Cheap solar and wind power, he concluded, will go a long way toward providing energy for development without carbon emissions.